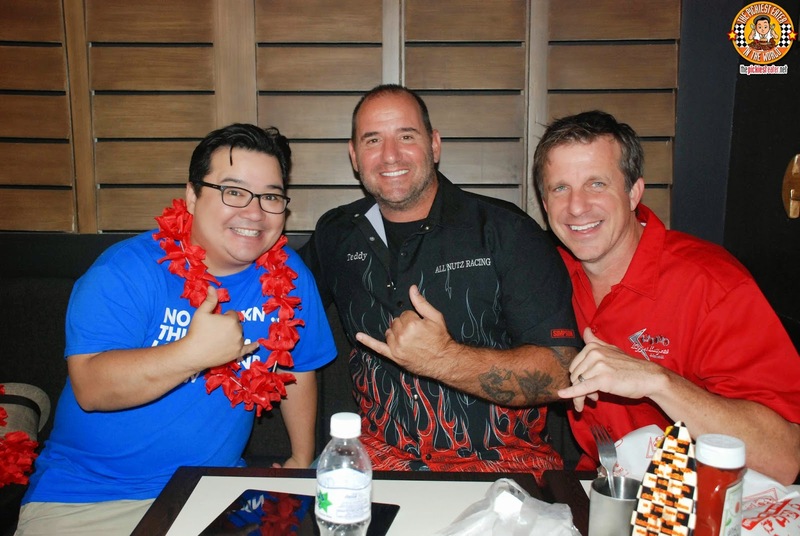 THE PICKIEST EATER IN THE WORLD: SAY ALOHA TO TEDDY'S BIGGER BURGERS IN GREENBELT! 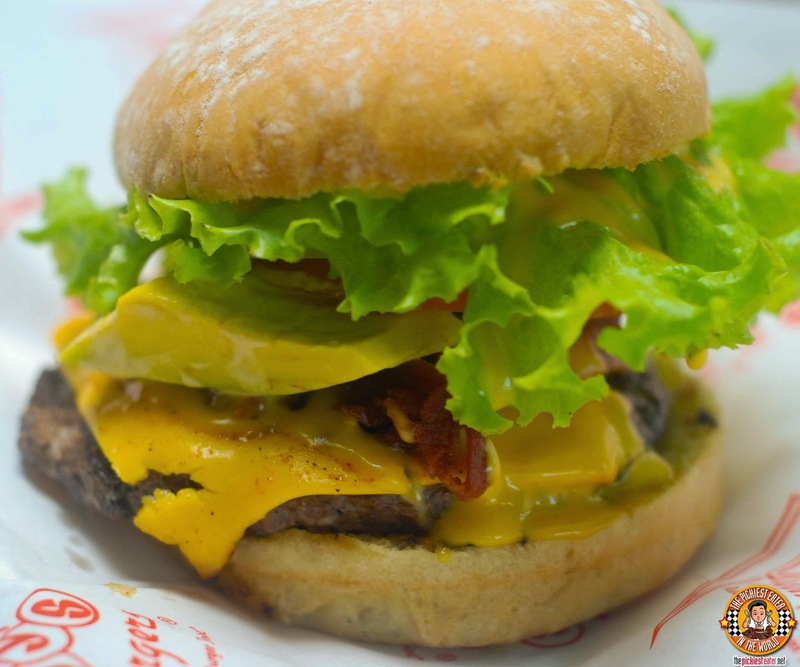 Situated in Greenbelt 3, Teddy's Bigger Burgers Philippines takes you on a gastronomic journey to the breathtaking shores of Hawaii, with not just its mouthwatering burgers, but also through its island themed ambiance. 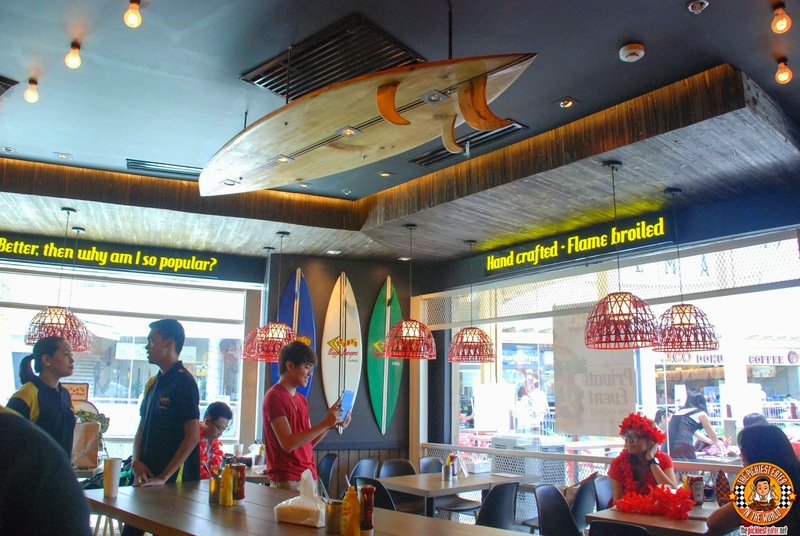 Surfboards adorn the walls, together with other fun touches that complete the beach vibe, making you feel like you were a few steps away from the sandy shores, instead of in the mall at the country's premiere central business district. 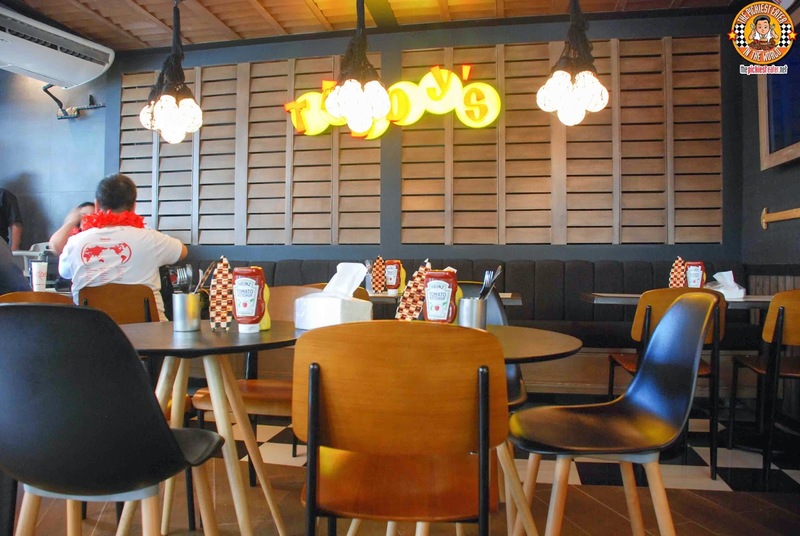 Teddy's Bigger Burgers is the brainchild of burger lovers Teddy Tsakiris, and Rich Stula, whose goal when setting up their business, was to "reinvent the burger joint". 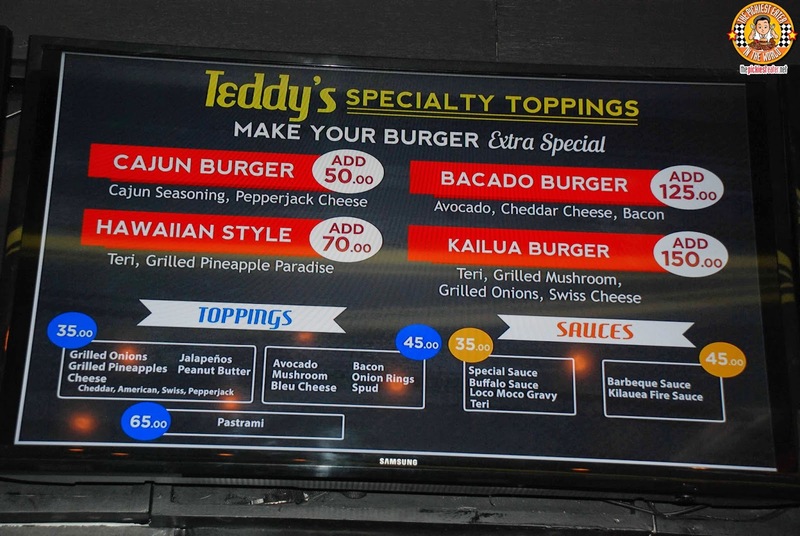 Since opening their first, rather modest restaurant in 1998, Teddy's has steadily made a name for itself as an emerging burger powerhouse, expanding to strategic locations all over Hawaii, before branching out to the mainland. In 2009, Teddy's opened it's first International Franchise in Tokyo, Japan, making the Greenbelt branch only the second branch outside of the USA. 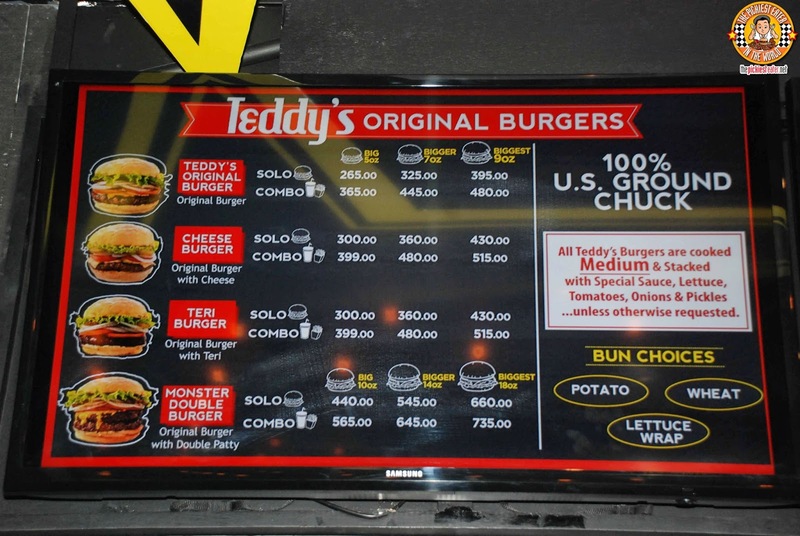 Teddy's Bigger Burgers was brought to the Philippines by the SumoBurger Global, inc., which I'm sure you know better as "Marvin Augustin's Restaurant Group". 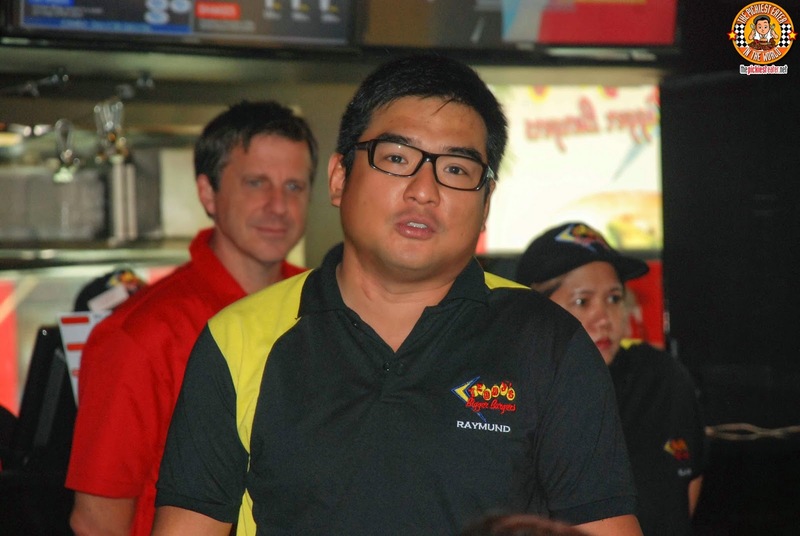 The group, which owns restaurants such as Banzai, John and Yoko, Sumo Sam (among many others), has emerged as a top player in the Philippine restaurant business, and their acquisition of the Teddy's Franchise here in the country only reaffirms that. 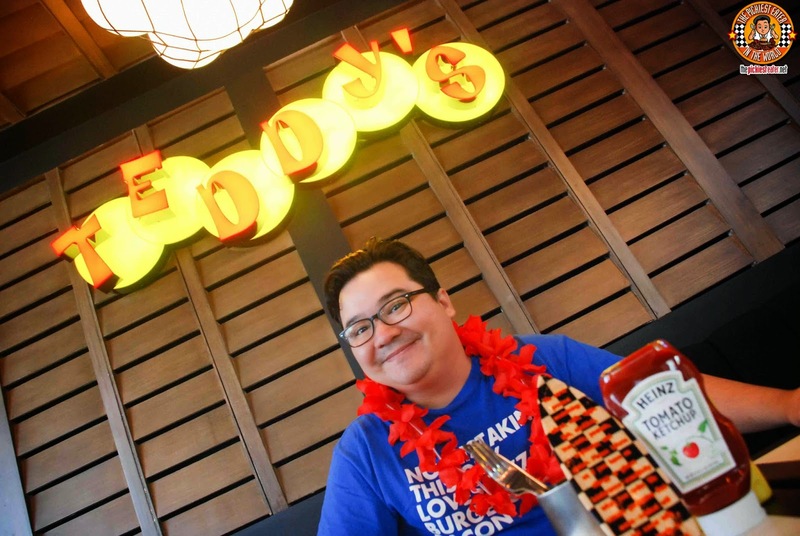 Teddy's was accidentally discovered by SumoBurger Group partner Raymund Magdaluyo during a trip to Oahu. 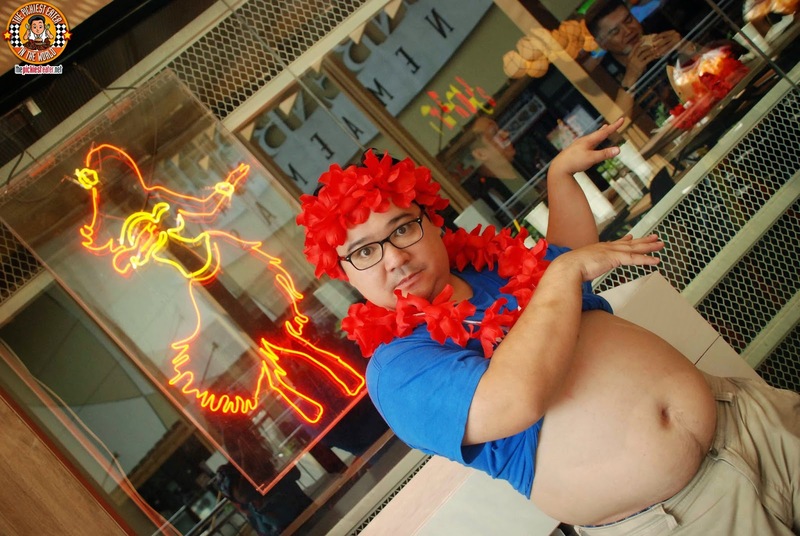 After a sudden change of the weather Magdaluyo found himself seeking shelter in the confines of a small burger joint, which he would eventually fall in love with. 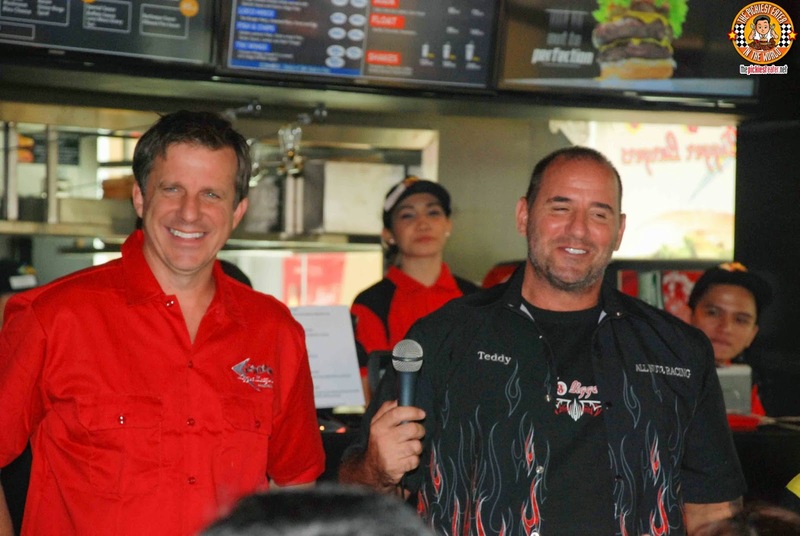 After introducing it to his partners, the group realized the potential Teddy's Bigger Burgers had in a burger hungry country such as ours.. A few meetings later with Ted and Rich, the wheels were set in motion to send Teddy's Charbroiled goodness to the Philippines. Teddy's is expected to open roughly around 8-9 more branches around the country within the next 4 years. Rina and I were fortunate enough to be invited to a "Sneak Peek" of what Teddy's was all about! Taking to account the palate of it's customers, Teddy's has come up with three dishes that were made, exclusively for the Filipino franchise. 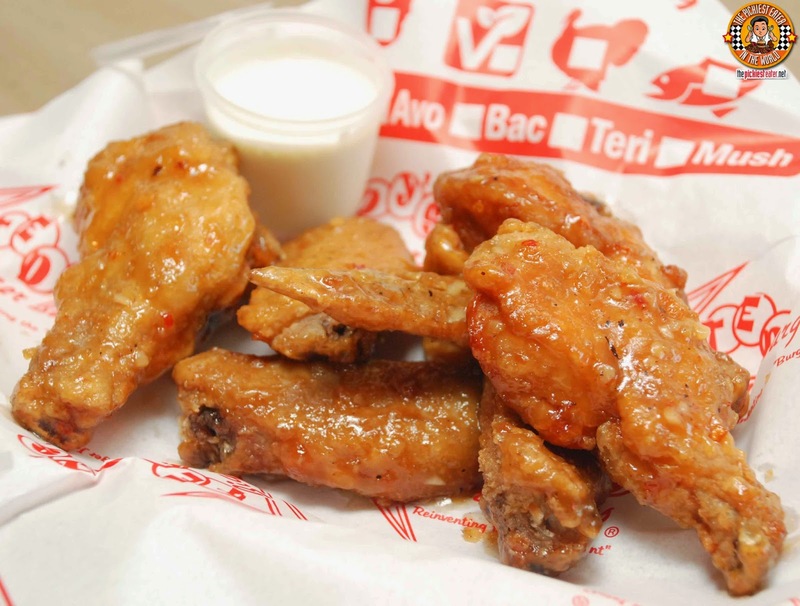 The first of those dishes, is the Tiki Wings (P295 6pcs/P415 6pc Combo/P560 12pcs). The wings are glazed in a sweet, lightly citric sauce, that gently kisses the crispy skin of the chicken, making eating only one piece an impossibility. The other dishes made for Pinoys are the Loco Moco (Burger Patty on a bed of steamed rice, topped with a fried egg and drowned in gravy), and the Chicken Tenders (Chicken Breast Strips with Fries). Though it's a thicker cut than I usually prefer, I gotta say, Teddy's French Fries are exactly. 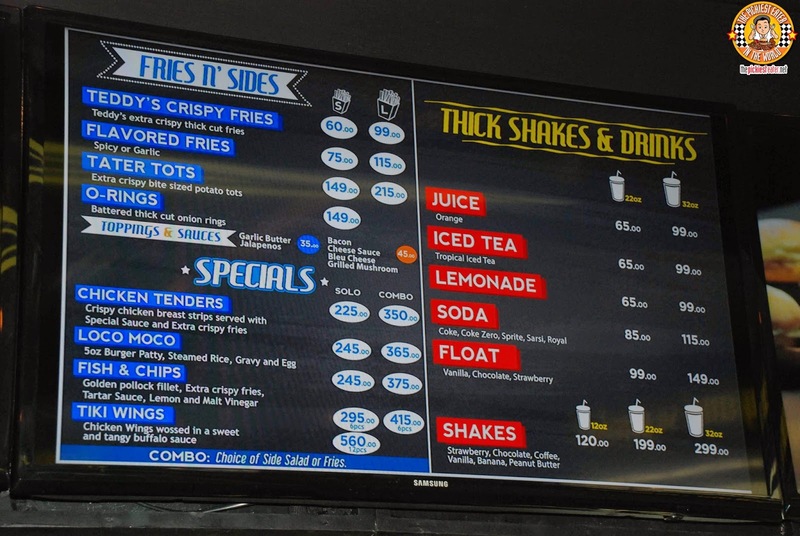 You order your Flavored Fries (P75 Small/P115 Large), then you may choose to top it with Cheese, Bacon Bits, Bleu Cheese, Grilled Mushrooms for an extra P45, or Jalapenos and Garlic Butter for an extra P35. 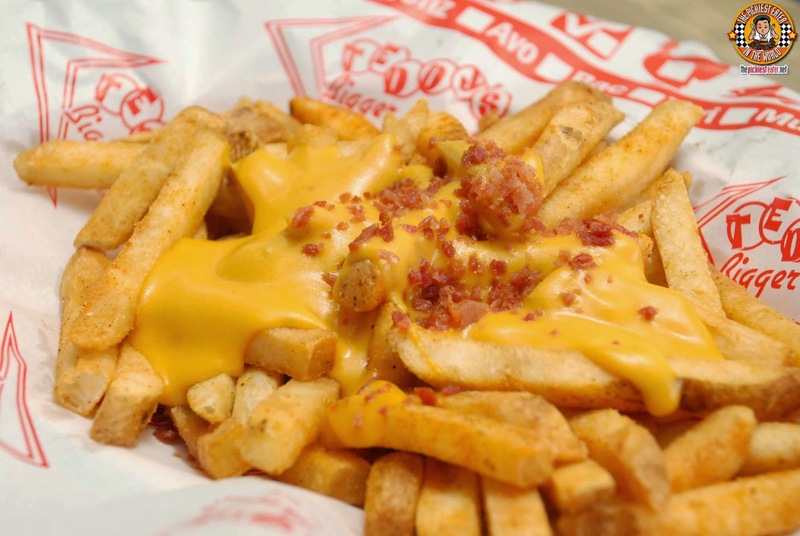 As much as I love me some Bacon and cheese, I strongly suggest you try the Butter Garlic Fries as well. 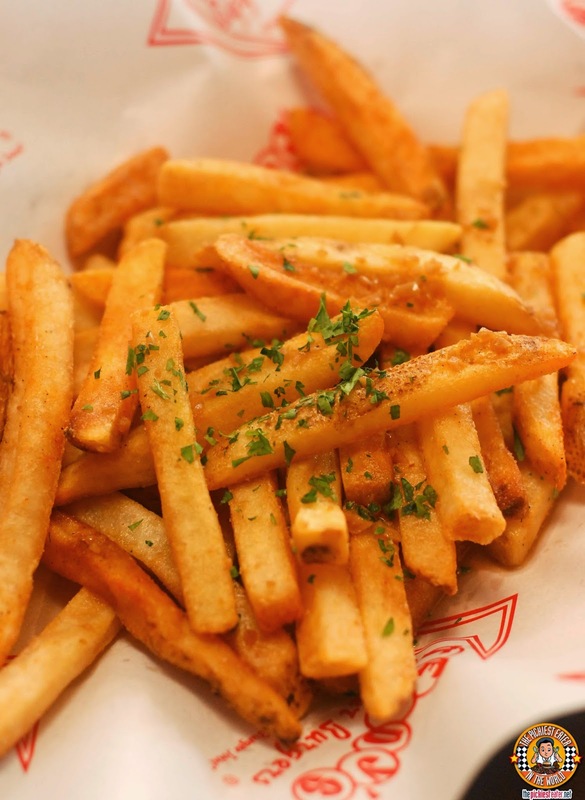 But truth be told, the fries are seasoned so amazingly, that it's darn good as is. 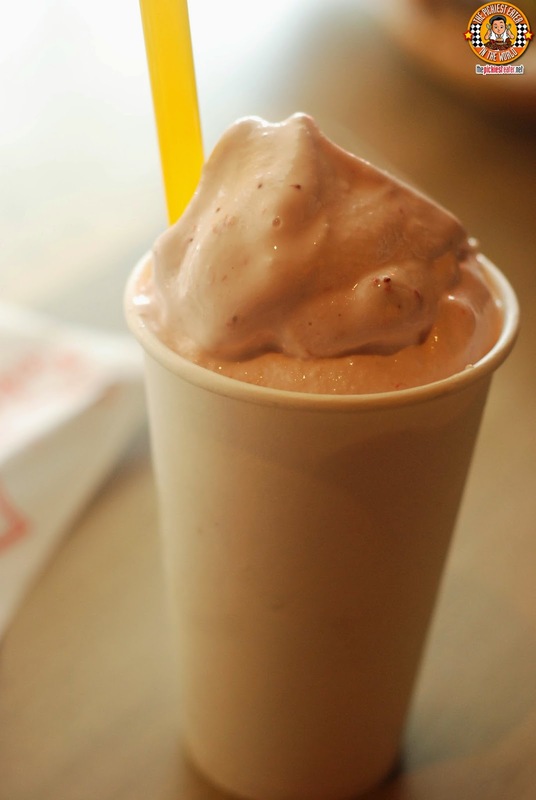 Teddy's takes pride in their shakes, being so thick, it seems closer to a parfait than it does a milkshake. The Shakes are basically 90% Ice Cream and 10% Milk, and are available in Strawberry, Vanilla, Chocolate, Peanut Butter, Coffee, and Banana. The Burgers are definitely what sets Teddy's apart from the rest. 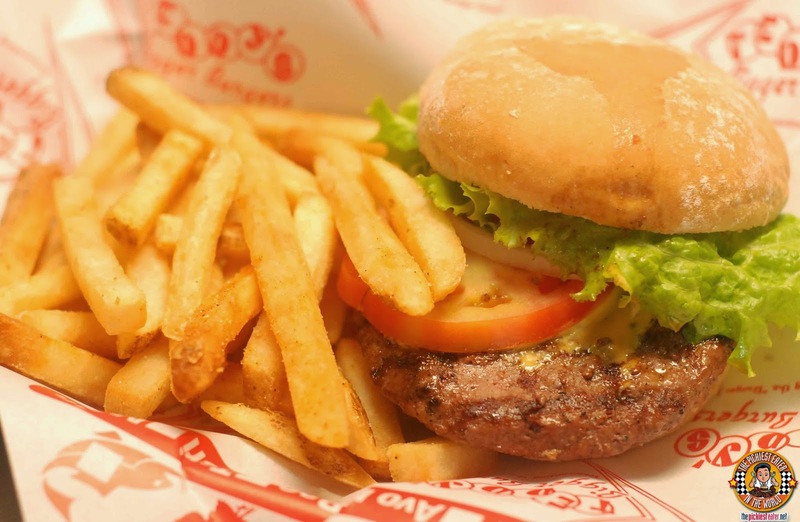 Extreme care is taken in the preparation of each burger, ensuring that every customer gets served the tastiest, highest quality burger, that Teddy's has been known for. The beef patties are made with 100% U.S. Ground Chuck, giving it a stamp of meatiness, while maintaining the juiciness of the meat when charbroiled. No extenders of any kind are used in the patties, which allows the natural flavor of the beef to shine through with every bite you take. 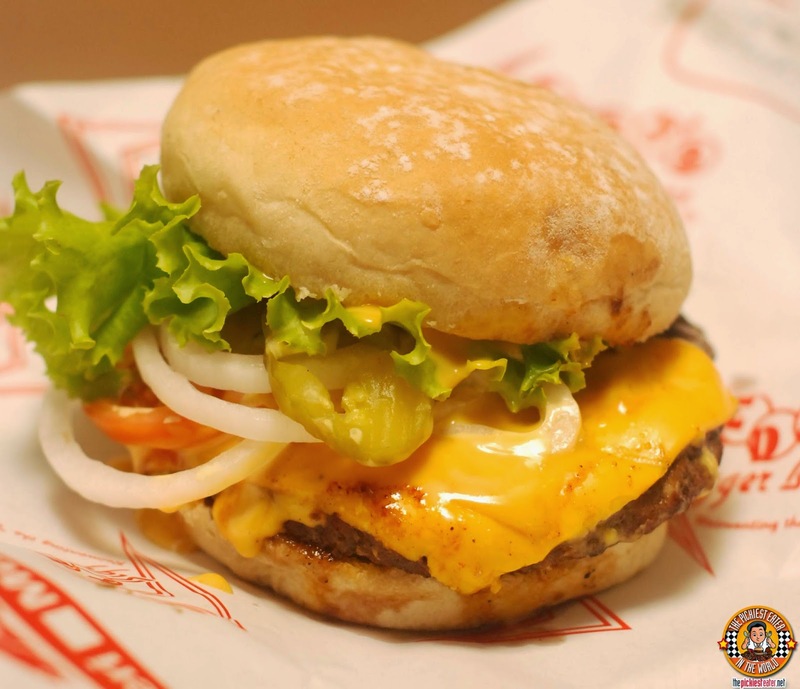 Every burger is made to order, so you are given the flexibility to customize your burger to your liking. The Burger toppings that are readily available are favorites such as Bacon, Cheese, and Onion Rings, to more eclectic choices such as Peanut Butter, Avocado and Pastrami. Unless otherwise specified, the burgers will have regular fix-ins in it such as tomato, onions, pickles and Teddy's Special sauce. Burger sizes also include burgers 5oz, 7oz or 9oz, or for heavy eaters, you may opt for the Monster Double Burger, that comes in sizes ranging from 10oz, 140z, and 180z. Something I noticed that made Teddy's Burgers really stand out is their bread. I've said it time and time again, the bread can make or break a burger or a sandwich. Well, Teddy's Potato Bread knocks it out of the park. It was soft and fluffy, was pillowy soft to the bite, but firm enough to hold together my behemoth of a burger. Combo meals include your choice of sides (Fries/Onion Rings/Tater Tots) and a drink. For those that enjoy the basics, you can enjoy Teddy's Original Burger.. But if you're like me, you need some cheese, then you can go for the Cheeseburger.. 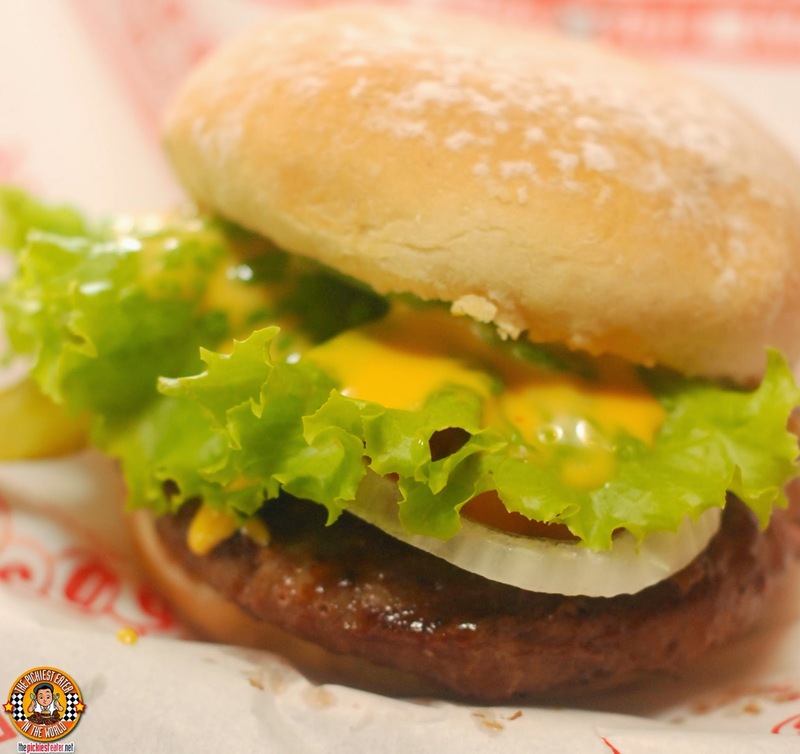 The Teri Burger is your burger basted in a sweet Teriyaki sauce, adding another dimension of flavor to an already awesome burger. 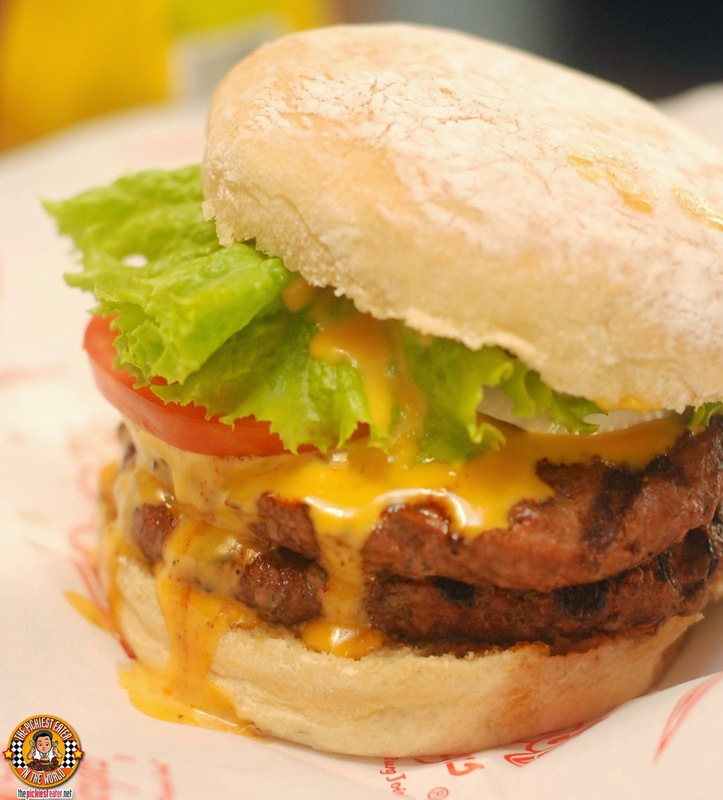 The big daddy of Teddy's menu is the Monster Double, which stacks two patties together, in sizes of your choice. Word of advice? The 10oz is more than enough. (But if you think can do more, you're a legend). The burger combinations that you can create at Teddy's can be overwhelming to those who aren't used to it. Teddy's takes that pressure away from you by coming up with some suggested combinations, with their "Teddy's Specialty Toppings"! Say Aloha to the Hawaiian Style Burger! 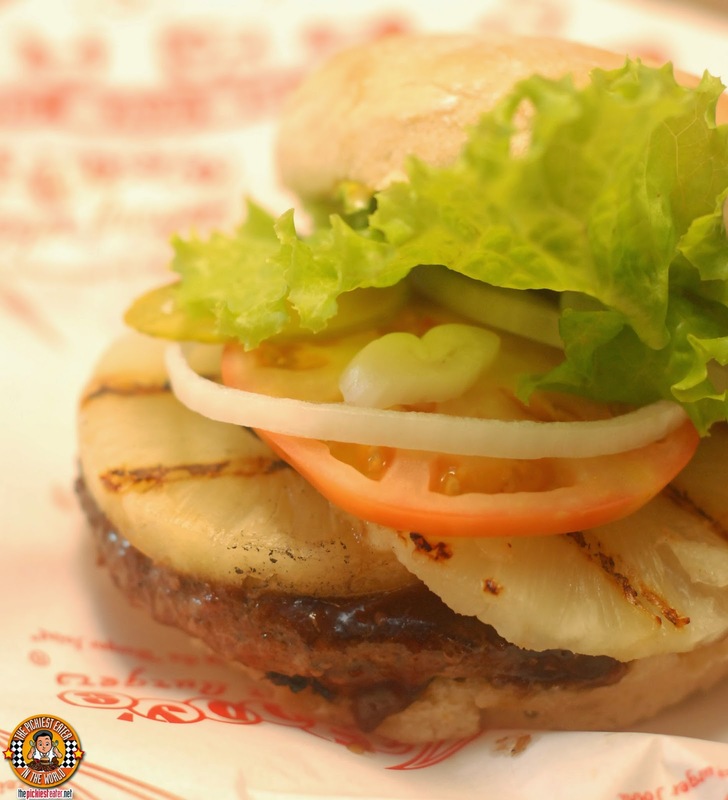 The Teri burger is topped with, Grilled Pineapple, creating a wonderful harmony of sweet and savory. The Bacado Burger is the Cheese Burger topped with Bacon and.. Get this.. Avocado! A little out of the box, yes, but I'm contemplating trying it during my next visit! 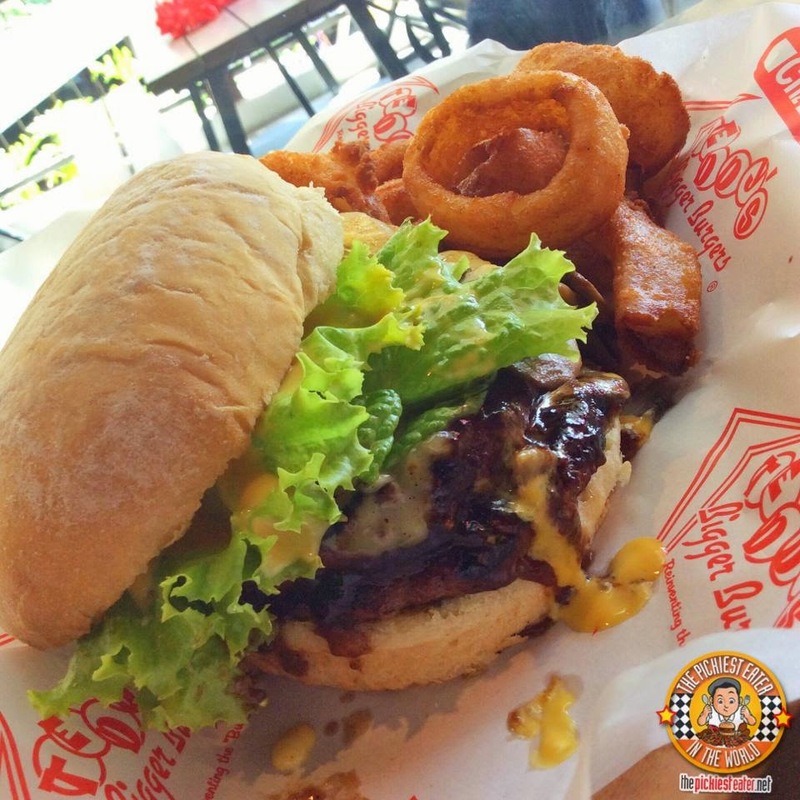 While the Kailua Burger is the Teri burger, topped with Grilled Mushrooms, Grilled Onions and Swiss Cheese. Which one did I order, you ask? Well, Rina got the Hawaiian, and I order the Kailua.. DOUBLE MONSTER. Yup. I'm not even sorry. The onion rings were quite good, but nothing really stand out like the fries were. One thing I noticed, is that Teddy's Secret sauce ROCKS! It's a great condiment that further enhances the burger's flavor.. Much better than ketchup or mustard ever could! Another thing I noticed, is the price. Teddy's Burgers definitely costs more than the norm, especially when you start customizing your order. But all I can say about that is, you see where your money is going in the quality of the ingredients used. Needless to say, Teddy's Bigger Burgers can stand toe to toe with the best I've tried in my entire life. 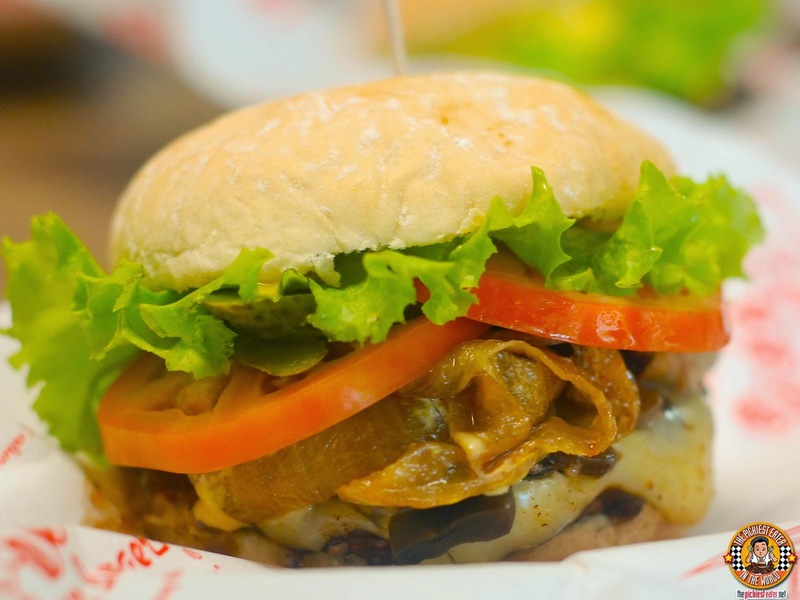 A welcome addition to the Philippine Burger scene! 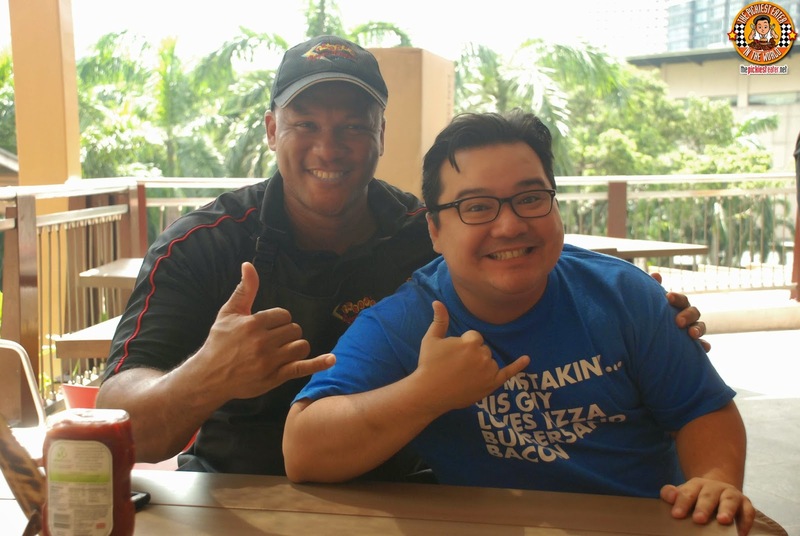 It was a pleasure to meet the hardworking staff of Teddy's Bigger Burgers, that was flown all the way from Hawaii just to train the Filipino Crew! I also enjoyed meeting the men behind the burgers, Ted and Rich. Hearing directly from them, the journey that they went through to get to where they are was truly inspiring, and I have no doubt in my mind that with the doors to the international scene opening up, a new journey is about to begin for Teddy's Burgers! Meanwhile, with my dreams of Hawaii still ingrained in my heart, Rina dared me to show off my Hula dance moves. Check out the awesome prizes Teddy's is giving away on their opening day to their first 100 customers!! I'm thinking of pitching a tent at Greenbelt 3.. Who's with me?!?! Next time Jeng, sabay tayo mag hula! I am soooo looking forward to the flavored fries and chicken tenders and yes, the Teddy's Original Burger..
Olga, if you like a little touch of sweetness, try the teri burger! Haha thanks! !